If you got an email from me today, but haven’t in MONTHS, I’m sorry! I totally get it if you’re no longer interested, have no idea who I am or don’t even remember subscribing to my blog. My blog feed has been broken for AGES and I hadn’t noticed! So, so sorry! I think it’s all fixed now and you should be getting emails from me now twice a week on Wednesdays and Sundays. Thanks for hanging with me! I just finished up a two-part series on YouTube about my end of the world keeper shelf. Like, the books I would want to have in the event of an electricity-ending dire emergency. I’m not sure what it says about me that I think this is more likely than being stranded on a desert island with a pile of paperbacks, but that is genuinely how I think about these books. 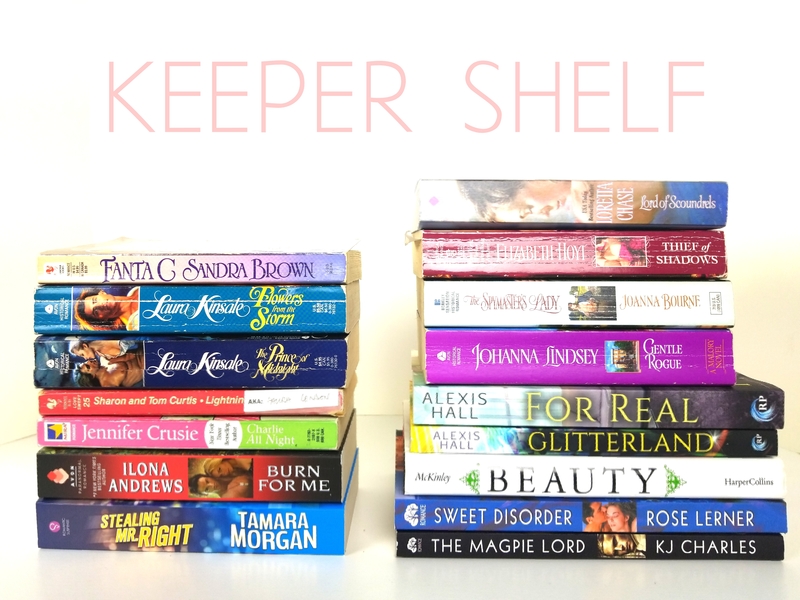 To hear the reasons why all these books are on my actual, physical keeper shelf, tune into the videos, part one: paranormals and contemporaries and part two: historical romances. And that’s all the books on my keeper shelf. Out of the 569 paperbacks I own, 18 of them are books I’ve already read and decided to keep. That right there is why I’m not buying books this year. So do you reread books? What’s on your end of the world keeper shelf? Oh wow! I’ve never met anyone else who has Beauty by Robin McKinley as a part of their permanent collection. I’ve been reading it at least once a year since I was a teenager. I’ve also been collecting the Spires series. I know better than to start reading a series without having all the books. I laughed at your declaration of 569 paperbacks. I have an entire library, now that my son has moved out. I think I have more paperbacks on just one of my shelves than you. Good luck with not purchasing any more. I’ve tried keeping that promise and have finally given up. Thanks for the great list! It’s given me a few new books to look up and try.